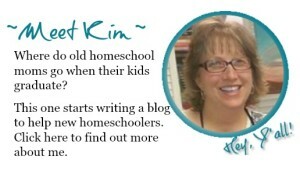 Welcome to South Carolina’s Homeschool Record Keeping 101. The 411 on everything you need to get started. The basics of what’s required in the law. No matter which accountability option you choose–these are the gonna be required. 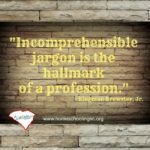 Depending on what accountability you choose, you may have to format certain parts or turn in various parts for evaluation. 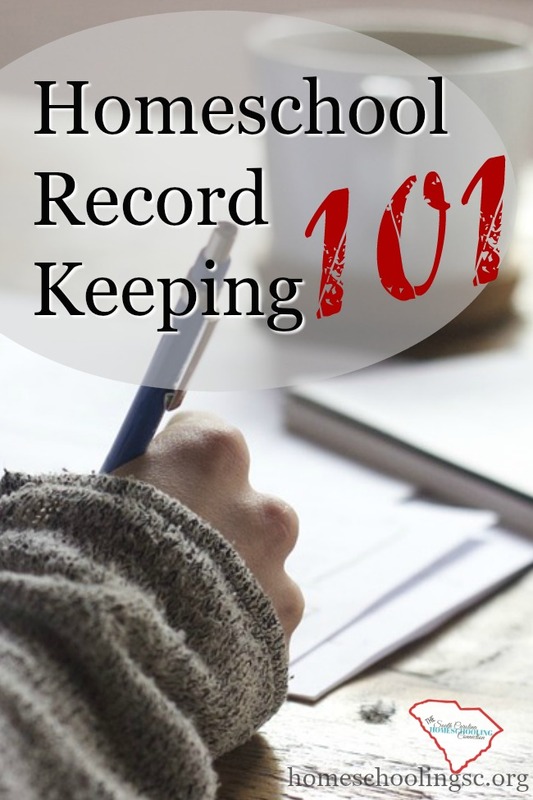 But, click here to read why you should keep good records anyway, even if the law didn’t say you had to do these things. The basic subjects are: Reading/Writing, Math, Science, Social Studies. You can add on any other subjects you want, like: PE, Art, Music, World Languages, Bible, you get the idea. When your student gets to 7th grade, the Reading/Writing is called Literature/Composition instead. You don’t have to cover all the subjects every day, just so long as you are getting to them. You might do Reading, Writing, Math everyday and alternate Science/Social Studies. You might get really involved in a science project that takes several weeks, then switch to a Social Studies project. 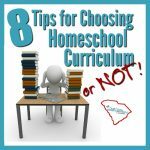 Lots of great resources are just a click away–I love CurrClick! Document 180 days. I believe we actually learn something everyday–that’s 365 days of learning. You just have to document 180 of them. I print out a one-page calendar, just check off the attendance days so I can total them at a glance. You might note it on your lesson plan instead. Just so you know when you get to 180. 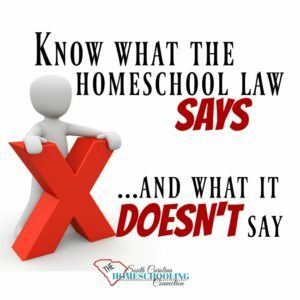 Note: Option 1 code of law (50-65-40) is the only homeschool law that indicates how much time is a day. Association Handbook policies may also specify. But, the code of law does not say what all should be accomplished in any given day or how long the day should be. If you’re a planner and organizer, then write down the amount of work in each subject that your student will complete. If you’re likely to go off-track of what you planned, then wait till the day or week is done and journal what learning activities were actually completed. Or do a hybrid of both. Format is entirely up to you. Write more than you erase or try not to erase at all. You might also find an app or online tracking format that eliminates the paperwork entirely. Be specific enough that you can see the student’s progress. It needs to be meaningful to you, even if it’s shorthand or scribbled notes that wouldn’t make sense to anyone else. You could (and will) translate it into something more meaningful at the semi-annual progress report. Samples of student’s work. Not every worksheet. Not even every test or paper is necessary. I’d say at least 3 samples from each subject. I’m personally inclined to keep more than I probably need to. But, a lot of our work has sentimental value to me. And I just can’t make myself part with some of it. Any purchases you make at CurrClick helps keep this blog running. We automatically think of report card…with A, B, C letter grades. But, I question if this is actually a meaningful assessment. Maybe a checklist of objectives in each subject would be more meaningful or a paragraph or 2 about the overall progress and goals. I’d like to lose 10 pounds and clean out my closet. But, if I don’t implement some daily plans, then in 6 months, I’ll reassess and find I have 13 pounds to lose and 2 closets to clean out. I think this assessment happens naturally about January and May/June when you think about what’s working and what’s not. What areas do you want to push harder or slack off? This is a check point to look back at what you’ve accomplished and set some goals toward what you might need to work on. I say, you should set some goals and let the kids set some goals of what they’d like to learn about, too. It’s easy to forget what you wanted to accomplish. The student wanted to learn crochet, but hasn’t yet. Do they still want to? Click here to read more about semi-annual progress report. 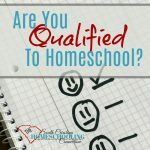 That’s all the homeschool record keeping you (the parent) are responsible to do. 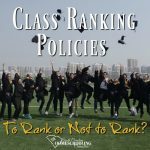 Check with your accountability to see if they require additional documentation, like long term lesson plans, curriculum choices or standardized testing. Each association can implement additional requirements for their accountability standards.